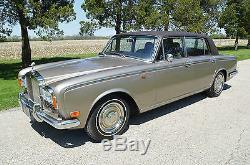 His is a rather lovely Rolls-Royce Silver Shadow Long Wheel Base ("LWB"), finished in Silver Sand with rich honey tan Connolly hide leather interior. The coach work waist-rails and hubcap beauty rings are finished in hand-painted dark brown to match the vinyl top. 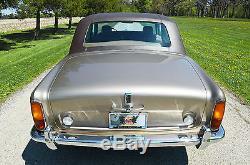 The long wheel base version of the Silver Shadow is easily identified by the small rear window (opera window) and standard fitment Everflex vinyl top, it is 4 longer in the rear door. This provides a noticeable increase in rear passenger space. This is a lovely condition example with a low 63,500 miles from only 1 owner from new. In the last 15 years, the car sat in a private collection display. This is a well presented example that displays all the hallmarks of a serious and dedicated owner. It was repainted some 15 years ago in its original colour and so the paint is in excellent condition. An original North American car that was never driven in inclement weather (and it shows), always climate control stored. 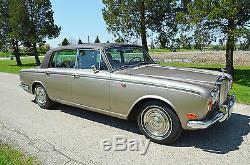 Very straight, very clean, very true in all characteristics Rolls-Royce. 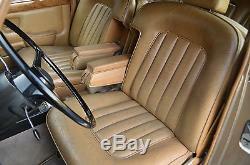 The interior is completely original. The Connolly hide leather is stunning. The leather finishes have never been redyed and not so much as even a touch-up, showing its original Connolly hide signature finish. Connolly leather has a 2-tone effect with a darker dressing in the depths of the grain. If you are familiar with. 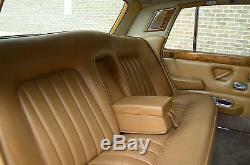 Leather in early Mercedes, you will understand this description, but with the Rolls-Royce leather, the effect being more subtle. Any form of redying, loses this burnished grain effect. This Shadow shows it off well with a beuatiful degree of warm patina to look like, and feel like, a high-end. So inviting you want to just sit in it for no reason. This is an example that looks like it is only a few years old. The African burl walnut's original French polishing is in good condition, only with minor hairline marks in the lacquer. The headliner is all original. As importantly, it has been maintained meticulously. 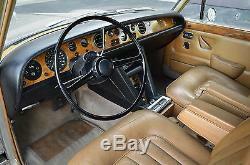 Although rarely driven in recent times, the car was kept in the collection under the eye of a Rolls-Royce caretaker who regularly maintained the car. Recent work performed includes a complete going over of the hydraulic and braking system; brake pumps, accumulators, accumulator valves, calipers, hoses, reservoir and system flush, etc. 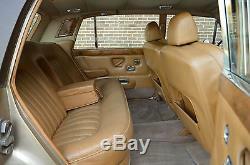 The car drives smooth, without any bumps, rattles or knocks. It truly floats like the Shadow of this era was designed and built to do. 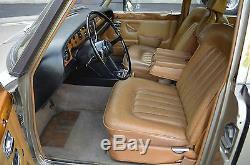 Testament of its well maintained history is the cleanliness under the hood. Not detailed but appropriately maintained. The trunk presents just as well without so much as mark in the carpet. Ll external bright-work is well above standard and lights and lenses excellent. Normally, the rear quarter bumpers rust out where the brackets are internally welded - no such thing here! The car is simply stunning to admire as well as drive. 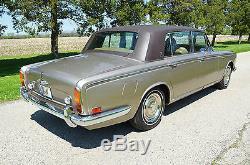 Driving this Rolls-Royce Silver Shadow is like trangressing back into the early 70s. It is a beautiful example of the Long Wheel Base model which can be driven as-is to your next Rolls-Royce show with pride. For extra photos on this fine example go to the link below. Rich brown pin-striping hand-painted by an artisan in accordance with the Crewe tradition. A low 63,500 miles! Original Connolly "hand-rubbed" leather finish. We can always be reached at. We at Park-Ward Motors the things we do. 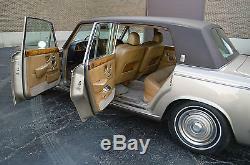 When our Rolls-Royces are commissioned for resale, they are indeed professionally and correctly fully work-shopped. And it is all addressed in true Crewe tradition. There is way too much to list here but to give you an example of our commitment to excellence of. 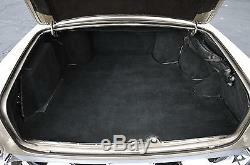 The splash plastic on the inside of the doors to protect the leather panels from rain splash from inside the door is replaced with correct specification black plastic as used by the factory. Cut to shape and glued in position as per original. All door hardware is checked and repaired as required including locks, handles and scuttle finishes. The door is reassembled with all items cleaned and polished. I have a long standing reputation being associated with the marque which I take seriously. I take pride in my cars and have fun in collecting and restoring them. As a collector and experienced restorer of the marque, I make every effort to bring my cars to a high standard. By comparison, my cars are generally superior to others available but they are by no means perfect. You must expect some issues. 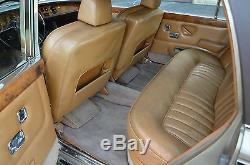 Unless specifically stated, the car is not of show standard but of nice "driver" condition. Please understand, show cars of this model cost hundreds of thousands of dollars to achieve and sell for prices commensurate, so the sale price of this car reflects its relative condition. Buyers should not expect to receive concours quality or "perfect" cars at these prices. 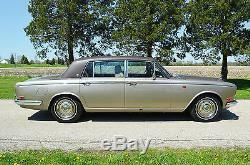 Please also understand, the very nature of these classic Rolls-Royces is such that it is not always possible to attend to every item, or perhaps I may have inadvertently overlooked items. 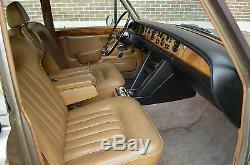 Further, and very importantly, these cars are classic cars also because they are old. So this means a 45 year old car is predominantly comprised of 45 year old parts. And old parts will fail. All buyers must understand and expect that things can or will wear out, break and/or stop functioning without notice. This is even more likely with hand-built English cars of early technology when compared to the typical American car of the same vintage. Please note, fitted radio/stereo systems are usually subject to upgrade by purchasers so I do not ensure operation of these. Similarly, cruise control systems fitted to these classics were of an inferior design and I do not check or warrant the operation of these. Suspension and brakes on these cars are complex. We thoroughly check them and replace things that are identified faulty. But please understand, by example; if we change a brake line because it appears aged or faulty, we do NOT at the same time replace all other hoses because they are of similar age. This is considered "preventative maintenance". Feel free to ask for this additional service. Further, a feature or function that is working perfectly one moment, may decide to play-up the next. After all, it is some 45 years old. 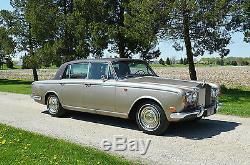 This is the nature of any classic car and especially a Rolls-Royce which was very "complicated" for its era. For this reason it is necessary for the following condition. If any aspect of the description contradicts what can be seen in the photos, then the photos shall prevail as the reference point. No allowance or set aside will be made on account of any incorrectness, unforeseen imperfection, defect or damage. Being a classic car in excess of 10 years of age, in most. States, the mileage may be recorded as exempt. Also, you must remember that this is a classic +/-45 year old vehicle, and while it is up to you, I do not recommend that you just hop in and drive it across the countryuntil you have familiarised yourself with the car. At least, I have never done that. I have always professionally transported the cars in enclosed carriers from where I bought them to my home. PLEASE; IF YOU ARE UNABLE TO ABIDE BY THESE TERMS, CONTACT ME BEFORE YOU CONTEMPLATE DOING SO AS, RESPECTFULLY, THERE CAN BE NO EXCEPTIONS. 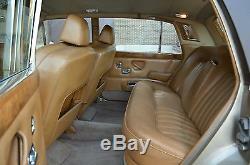 Very simply put, this is an old car being offered for sale. 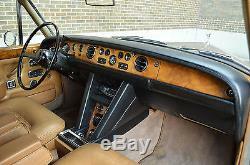 You need to be a special and considerate type of purchaser to own a Rolls-Royce. Their down-side is part of the fun in owning them! As the old saying goes; we love to hate them and hate to love them! IMPORTANT NOTE : As a professional collector and experienced restorer, I have my own Rolls-Royce dedicated workshop with qualified craftsmen on hand; The Park-Ward Motor Museum. As a passionate collector of the marque I take great pride and pleasure in passing on any of these great cars to its next owner (caretaker). Certain items such as final electrical tests and hydraulic pressure checks are usually left for this stage as these are considered "commissioning procedures". 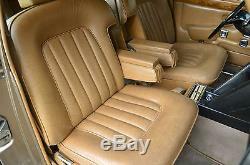 In this case, this will include the air conditioning system of this car. This is all done at NO CHARGE. We call this; "Predelivery Commissioning". We will keep you posted every step of the way. 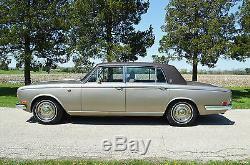 Hopefully this will provide a reference point for the Rolls-Royce being featured in this listing as it compares to the range of different condition examples. So don't be fooled by "cheap buys". 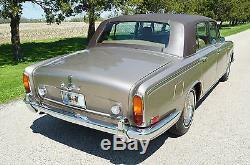 For any specific questions about this unique example of a Rolls-Royce, please do not hesitate to contact me. According to the London based investment research firm; Historic Automobile Group International, classic cars have appreciated on average, 13% per year since 1980, whilst overall stock values averaged an 11% gain over the same period. The following graph charts the value of collectible cars vs. 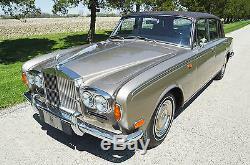 The item "Rolls-Royce Silver Shadow Long Wheel Base (LWB)" is in sale since Friday, May 06, 2016. 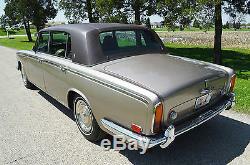 This item is in the category "eBay Motors\Cars & Trucks\Rolls-Royce\Silver Shadow". SubTitle: 1 owner! 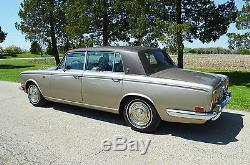 Low miles, beautiful presenting LWB Silver Shadow.